Today we’re playing Mark Twain. Read slowly, and with a hint of a drawl. We’re sitting on the banks of the Chao Phraya River—it’s warm, yessir, decidedly warm—and watching the murky water. Need a drink? Take a sip from this coconut. Yessir, I agree, the husk is just about the color of the river isn’t it? Don’t let the shade of the coconut or the water bother you a bit. All rivers are beautiful no matter their color, and the Chao Phraya doubly so, I should say. Just look around at the many marvels of construction upon her banks. Why, from where we sit we have a captain’s view of the Hilton. And that Sheraton is barely spitting distance away. They must have thirty shiny stories apiece. A newly minted nickel would be ashamed to stand next to them. A party boat pulls up to the wharf across from the Hilton and to starboard of the Sheraton. 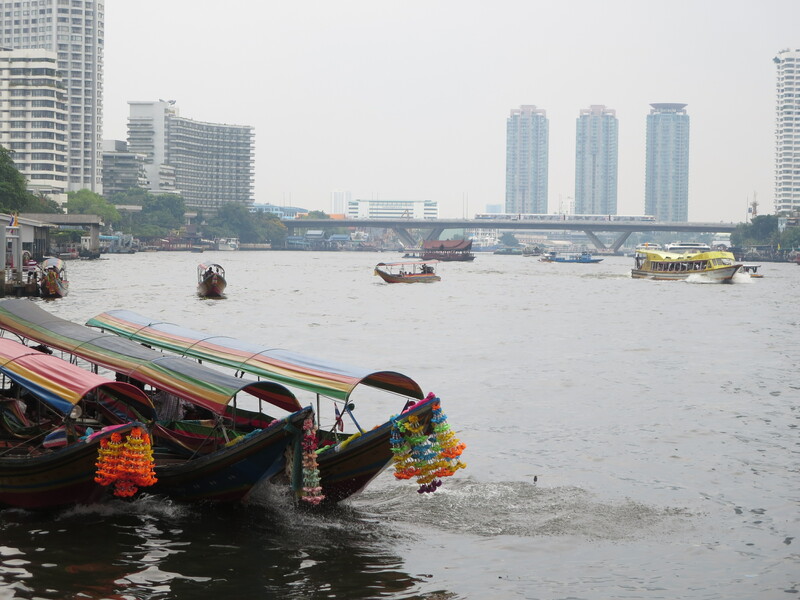 Dozens of these craft sail the Chao Phraya, from before lunchtime until the wee hours of the morning. Click the photo to enlarge. But not the Chao Phraya. Nosir. She lays down right between those magnificent towers, and lets anyone see what it’s like to be a true river of Asia: as brown as the earth, as slow as the sun, and as powerful as anything you shall ever meet in your mortal life. Am I to gather from your dress that you are new to these parts? Yessir, she is mighty slow and powerful. Just a few years ago she decided to flood. It started up north, maybe 200 miles from here. Did I say slow? It took the flood more than a month to reach this strapping young city of Bangkok. These marvels of construction we’re inspecting didn’t stand a chance. Nothing could keep her out. She closed them with water for weeks and then meandered on to the gulf while people mopped and swept and whitewashed for months. 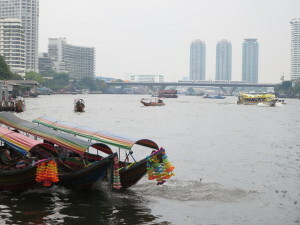 Typical river traffic and skyline of the Chao Phraya. Click the photo to enlarge. And yet you see how gentle she is. How many boats can we see right now, without even turning our heads? Fifteen? Twenty? Each one of them floats so easily atop her. And she treats all boats equally. That white one there, the one so sharp it looks like you could shave with it? Yessir, with the white-hatted chefs all lined up near the gangplank as they dock? 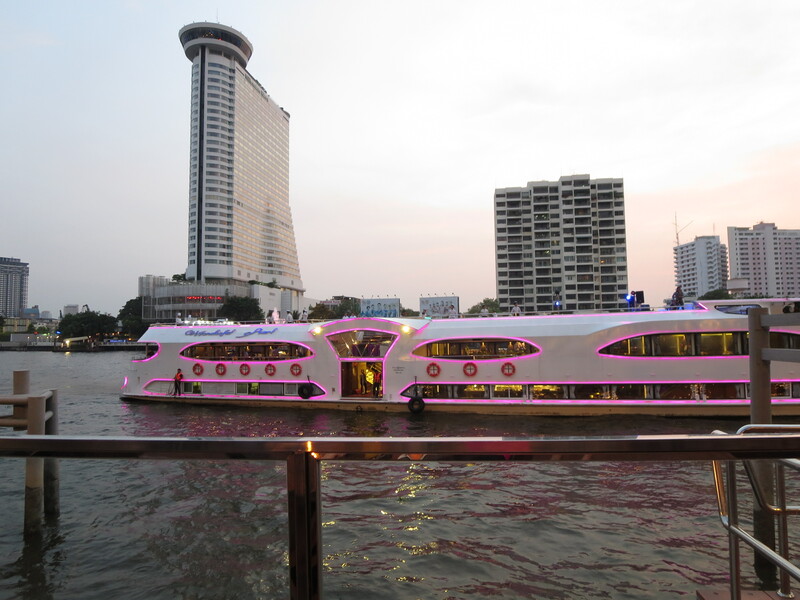 That boat has but one purpose, to serve the loftiest of French cuisine right here in Siam. Compare that heavenly looking craft to the tug and its wagon train of barges going up river near the western shore. It’s a garbage scow. It fills up with Bangkok’s trash somewhere north of town and hauls refuse down to the ocean every living day. The Chao Phraya floats them both, rusts them both, gives a living to both crews. Thai sailors, just under way on a cross-river ferry, look towards their headquarters. Six baht gets anyone across, civilian or soldier. Click the photo to enlarge. Speaking of boats, you see that little one over there, blue and red and barely bigger than a schooner’s painter? That’s a fishing boat. Yessir, that man in the stern—he is a patriot I do not doubt, since his boat wears the colors of the Thai flag—is about to cast his net. The Chao Phraya will give him some fish, and in turn he will help feed Bangkok. She is a generous river, nourishing Bangkok, connecting the two sides of Bangkok, lending her character and personality to the city. I’ve seen some big rivers in my day. The Chao Phraya is not the biggest. Nosir, not even close, but she is a river with a gigantic heart. Can you imagine this city without her? Bangkok would be an empty shadow of itself: flat and hot and pointless, merely Atlanta with better food and a more feminine script. Am I right, is your coconut empty? That gentleman, yessir, the one with the aged hookbill knife and the never-failing Thai smile, he will cut you a new one for just twenty baht, and I have a little bottle of bourbon here, that when added to the hollow of a coconut, will make the time and the river pass even more slowly. A monk chats with a young man on a down-river ferry. In the background is Wat Kalayanamitr, a house of worship for Buddhists. 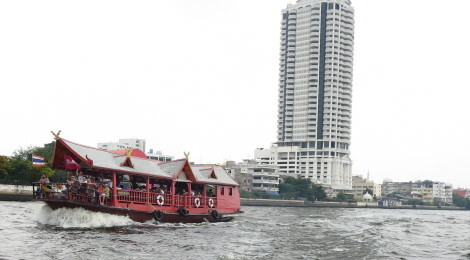 Many of the most glorious Wats are easily visible from the Chao Phraya. Click the photo to enlarge.